HOP! is a Mummy and Me playgroup-style English class. The whole class is conducted in English, with a similar rhythm to each session, so that the children become used to the cycle of the class and feel secure. I have designed a themed curriculum based on a toddler’s world, with topics such as animals, transport, family, colours and shapes. Within each class we sing songs, do crafts, play card and board games, dance and read stories all based on the current theme. Each theme lasts from 5 to 8 weeks, so there is plenty of time to learn the songs and the vocabulary! Most of all, I want the children to have fun with their carers in English and to learn a little of playing together with friends. SKIP! is a Mummy and Me playgroup-style English class. The whole class is conducted in English, with a similar rhythm to each class, so that the children become used to the cycle of the class and feel secure. The curriculum continues to be theme-based, with with activities appropriate for each age group. Within each class we sing songs, do crafts, play card and board games, dance and read stories all based on the current theme. From Nensho onwards, phonics is gradually introduced, so that in the early years the students will be able to recognize letters and their sounds, and by the time they finish kindergarten, be able to write them too. Other basic literacy work is introduced in keeping with each theme. ■Student Study Pack:¥3700 (Will be used until the end of Kindergarten.) Pack includes student bag, file, Young Children’s Picture Dictionary, Audio CD of songs. ■Class size:Maximum of six students. ■Siblings policy:Baby siblings under one year old are welcome to attend at no charge. Siblings over one year who are enrolled in Action English Eniwa are welcome to attend their siblings HOP! or SKIP! classes under parental supervison. ■Siblings policy:Baby siblings under one year old are welcome to attend at no charge. Siblings over one and a half years old, who are enrolled in Action English Eniwa are welcome to attend their siblings HOP! or SKIP! JUMP! Beginner classes aim to teach all four skills of listening, speaking, reading and writing. Classes are conducted in English as far as possible, and students are encouraged respond likewise. Reading and writing is taught using phonics, so that students can build up independent reading, writing and spelling skills. Songs, card games, pair work games, puzzles, videos and ipad applications are all used during classes to indroduce the skills being studied in a variety of ways. Homework is given for review most weeks, and summer and winter homework is also given. Junior High School classes follow the Japanese order of study, but with a stronger emphasis on speaking and actually using the English structures than can be provided in most public schools. Phonics is also taught and reviewed so that students can read and write independently. Pair work, video, ipad applications, card games and role play are used to present the work in a variety of ways. Each week there is a mini spelling challenge, and homework is given for review most weeks. Summer and winter homework is also given. 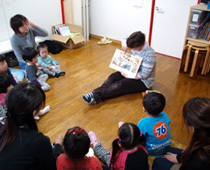 ■Time:Times of classes depend on the age and level of the students. ■Student Study Pack:Beginners Pack ¥5,000 Pack includes student bag, file, phonics memory card, Finding Out 1 Classbook and Homebooks, Fun Phonics Reader level 1 and a phonics workbook. After the beginners pack, materials are only purchased as the students complete textbooks. ■Class size:Maximum of eight students. ■Siblings policy:Siblings of Kindergarten students who cannot be left alone at home are welcome to attend their younger siblings classes, under parental supervision. Younger siblings are not permitted in Elementary JUMP! classes. ■Age:Junior High School level students. ■Student Study Pack:¥3,000. Includes Stories for Young Readers, Dialogs for Young Readers, Workbook, File. ■Class size:Maximum of nine students. Over cups of tea or coffee, in a relaxed atmosphere, common grammar patterns and idioms appropriate to each level are taught using conversation targets from the text books. In addition, we talk about news and events of the past week. Students are welcome to bring questions about English to the classroom and we’ll discuss them together. I also keep a large collection of leveled English readers exclusively for adult students’ use. ■Student Study Pack:Textbooks are selected according to the needs and wishes of class members, and on average cost around ¥4000. New materials are only purchased when the old ones are fully completed.